Luxury and humour are not easy bedfellows. Where luxury takes itself very seriously and conforms to rules, humour gets the uncontrollable giggles. 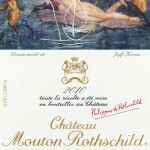 If humour happens in luxury then it is not often intentional, which is why I found the latest Mouton-Rothschild 2010 label breathtaking – a first growth with a sense of humour. Jeff Koons work comments on commercial culture we live in by blowing it up out of proportion to see it out of context. The huge Puppy (1992) made out of flowers; Balloon Dog (1994-2000), extra-sized, twisted balloon art made in silver silver stainless steel; or, the self-portraits of him and his then wife Cicciolina like a pornographic Botticelli in Made in Heaven (1989 -1990, & nsfw). One of his early series was called, “Luxury and Degradation” (1986) based on spirits such as Jim Beam and Hennessey “The Civilised Way to Lay Down the Law”. I have seen the Puppy a few times around the world and loved how it endeared the very young and very old. The label has an absent-minded graffiti over the classical repose. It is an interesting choice by Mouton Rothschild – is this choice a comment on the banality of the bubble-like prices of 2010 vintage? Not likely. After 2009, the 2010 vintage was another high-priced vintage but I prefer the 2010s to the full-frontal fruit in 2009. Out of all the first growth Bordeaux, Mouton always feels more accessible in style. The labels are always whimsical and by amazing artists, which is part of the charm: when you don’t have to prove anything you can afford to laugh and that is an even greater luxury than wine. Thank you to the Chateau for sending the label.